Nokia Philippines has an answer to LG's upcoming sale this November 13, 2010 (Saturday). Earlier this week, LG announced its 50% promo of an Android phone called Optimus One. 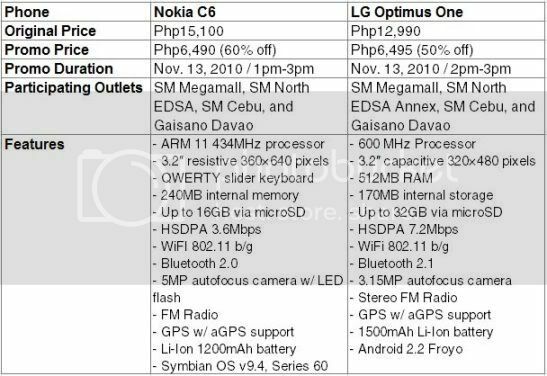 However, Nokia Philippines released sort of an "in-yo-face" 60% promo better than LG's, well, in one way or another. 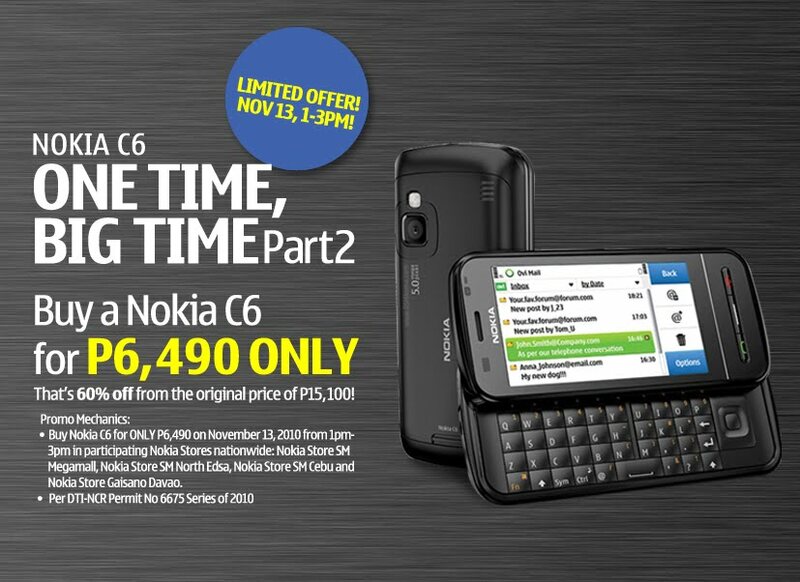 After the success of the Nokia C3's One Time Big Time promo last July, Nokia Philippines is back with another one! 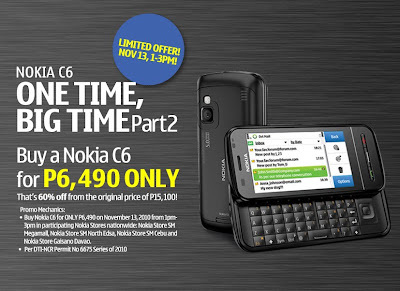 Offering you 60% off for the brand new Nokia C6, you only need to pay Php6,490 instead of Php15,100. Comparing Nokia C6 with LG's Optimus One, here's a quick run down of both phones. You be the judge. Does C6 have a chat-style SMS system? This is so so so so so tempting. Really. Especially since the cameras of Nokia's phones have started improving. Android 2.2 nga yung sa LG, maganda nga specs pero 170Mb lang ang internal memory, take note that not all apps sa Android market may Apps to SD so expect na puno agad yung 170Mb internal memory. Unless you know how to cook your own ROM and remove some preinstalled applications sa android to free up some space. BUT i think pwede na tong music player/phone kesa mag Itouch pa. BWAHAHA. Sa nokia naman, ok lang, steady lang. pero i will not buy that for 15k. LG is a big loser.